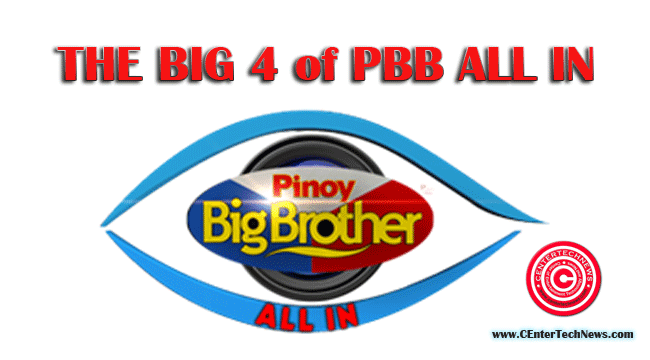 Home Entertainment PBB All In Housemate PBB All In Updates PBB BIG 4 Pinoy Big Brother Television Pinoy Big Brother: Who will be The BIG 4 of PBB All In? Pinoy Big Brother: Who will be The BIG 4 of PBB All In? The BIG 4 of PBB All In: The Pinoy Big Brother All In is about to make its final conclusion regarding the 4 housemates who made it. The housemates already exceeded 100 days inside the house and supposedly there is already a result but due to the twists that Big Brother did inside the house, it is extended for days still unknown. Now, with regards to the Big 4, we all have our own choices and by merely watching the latest episodes of the reality show. Those are the things that you need to know about the possible Big 4. The list is not yet complete and we still need to watch a few episodes to complete the list. The days are coming and the housemates are trying their best inside the house for people to know who among them will be put to the Big 4. Starting with Loisa, we have known this teen who have shown the real she inside the PBB house. The strong points of Loisa are her being true to herself, being a good listener, strong and enthusiastic. You will see her during her tasks that she never gave up. Maris is one of the most talented housemates inside the PBB house. We have seen her sing a lot of covers of the songs she liked and though being young, she went through a lot of challenges that gave us an idea that Maris is more than a teen. She is simple and kind. Vickie is sweet and loving as what we have known during the visit of her boyfriend Jason Abalos. Daniel is hardworking and independent. He was the reason why a lot of tasks became successful. Jane though nominated a lot of times has fought on her feet her destiny to stay longer inside the house. Who do you think among the four deserves to be included in the Big 4? Well, with regards to the price that he housemates will be winning once they will be included in the Big 4, you can read The List of Prizes for Winning Housemates in PBB All In Edition 2014 here. Aside from the decision of who among the housemates will top the competition, there is another competition called the PBB UBER AWARDS that you need to know about to vote.